The other day at work we discussed what I will call “windows of deliciousness” over lunch. A window of deliciousness is the period of time during which a certain kind of food is at its most delicious. Most hot foods start out at peak deliciousness, but once they cool down to a certain extent, they are no longer what could be termed “delicious.” The window of deliciousness for many types of food, from “straight out of the kitchen” to “too cold” might last 10 minutes or so. But there are exceptions. This got me thinking about western food, and how its windows of deliciousness might compare. I immediately thought of pizza, and realized that pizza is just as special in terms of window of deliciousness as 小笼包, but for the opposite reasons. Freshly made pizza is delicious. Sure, the cheese might be hot at first, but it’s nothing like the lethal lava-broth that the tiny devil dumplings are packing. As pizza cools, it loses a bit of its deliciousness, but the story doesn’t end there. You take the uneaten portion home and plant it in your refrigerator. In that wintry cocoon your pizza undergoes a miraculous phase transition. It is no longer just “pizza.” It emerges from the metamorphosis an entirely new animal: leftover pizza. Leftover pizza is different because you eat it cold. In that state, its window of deliciousness has gotten a second wind, which fades only as the pizza once again approaches room temperature. That’s not much of a concern, however, because the chances are good that the pizza will never survive that long. Let me reiterate the important point: pizza has two windows of deliciousness, both of respectable length. This is frickin’ amazing. I can’t confirm it quite yet, but I think this research may lead directly to the ultimate, incontrovertible triumph of western food over Chinese cookery. I am quite certain that when faced with this new evidence the Chinese will gracefully concede defeat in this long and bitter war of the cuisines. Kudos. That is frickin’ funny! But 五香牛肉 has a pretty long window of deliciousness (at least a whole day). Someone is fiending for some deep dish pizza! ah, but the Sichuanese rise to the challenge. Hotpot stock gets better with leftovers as does many marinades for chilled liang ban dishes: it seems like they peak after several days (keep refrigerated of course). But you’re right on one point: pizza triumphs in this respect. Could the same be said for a good indian curry? You can leave that stuff anywhere for days and come back it will still be edible. How about leftover spaghetti? Think about it: almost all of the “Americanized” Italian dishes (pizza, spaghetti, lasagna) have that quality of 2 windows. Maybe not in the sense that you present the pizza, though. It’s a personal thing. I, personally, am not a fan of cold, leftover pizza. Reheated is OK. In fact, I just had some for lunch today that had been refrigerated for 3 days. Left over spaghetti almost tastes better when left over & reheated. Usually, there’s not any lasagna leftover. That one may be harder to test. Chili is another reheated favorite. Syrian style (not doused in butter, ala Greek) stuffed grapeleaves are really neat. They’re good hot or cold, fresh or left over. The Greek style, using butter, makes them a little greasy when eaten (if eaten) cold. This may lead to some really interesting research! Expect good things! Leftover chicken & broccoli, not put in the fridge but left to simmer over some slight heatsource for several hours, then mixed with rice, is REALLY good. It looks unappetizing since all the green vegetables have started to yellow, but it tastes better than right after the dish was cooked. My dad had a term for those leftovers in Ningbo-hua, so the people there must’ve done something like that (though they probably used preserved pork, lard, jielan, and mustard greens as the ingredients instead). Great post John! And eating 小笼包 while still at temperature-of-the-sun hotness is a compulsion that I just can’t seem to stop – no matter how many times I’ve cursed it while tonging the damaged roof of my mouth for a couple days. Incidentally, 东北小笼包 tend to have a much thicker outer layer, and therefor absorb most of the “soup”… it’s still hot, but not as bad (and not as tasty). AND, just FYI – the “soup” comes from the use of pig’s skin jelly … all that creamy fat to melt up. Ack! I’m missing about a quarter of the skin on the roof of my mouth as I type this thanks to one of those @#$%ing xiaolong baos. Pizza definitively wins. I forgot – last time I went hiking in the western wilderness of China I packed my rucksack with a good dozen or so Mc Donalds Cheeseburgers. They last for AGES in plastic zip lock bags, they are indestructible and reasonably edible and packed full of carbs and fat! Maybe there is a third variant, try this: Burn the pizza a little bit (extreme cross so to speak), put it in a plastic bag while still warm (not right out of the oven), and carry it. Eat whenever you like. The bag keeps the humidity in, makes the extreme-cross to just right. Good for traveling. Yummy! You’re forgetting though, John P, that the Chinese invented pizza. I have been taught to nibble a small hole in the 小笼包 and then deposit the soup into a spoon before consuming. Is this standard practice or have I been led astray??? Bet you eat your pizza with a knife and fork, too, Matt. You only make a hole if your buns have a skin that’s been steamed too smooth to soak up any vinegar and you need an alternate delivery method. Beer Battered Bacon Strips…a heavy dose of salt and dipped into Blue Cheese Ranch Sauce. Imagine eating this outside of hte window of deliciousness when it’s hard as a rubber eraser. @John: Never! Never shall we concede defeat! 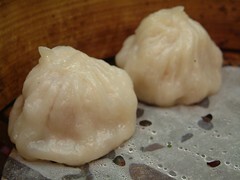 For me, the xiao long bao and pizza both need to sit a bit before I can eat them. I hate burnt mouth feeling the next day. You could also classify a lot of chinese foods by their “windows of bowel disruptiveness.” The 凉面 here essentially have a never closing window, and always provide lots of quality time on the toilet, but some of the other Chengdu snacks only seem to really wreak havoc on your digestive system if you eat them fresh, such as the 包子 or the weird egg pancake thingies that they wrap around meat sticks. Maybe re-heating them kills all the bacteria that were missed the first time around. I know this is a really old entry, but I’m enjoying reading your archives. You know what Chinese food also has two windows of deliciousness? 生煎. I had them at dinner, fresh at the restaurant? MMM, delicious. The next morning, leftovers out of the fridge? slightly different but still, MMM, delicious.